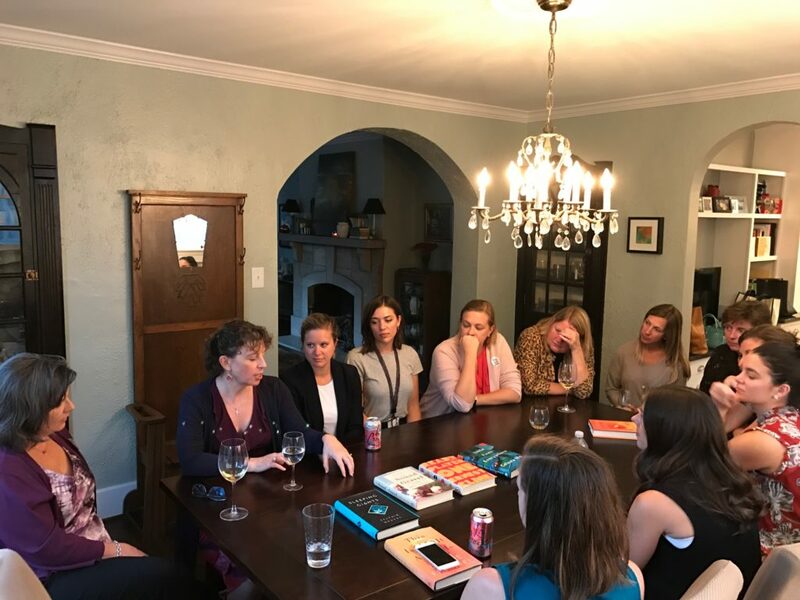 In Stretched Too Thin, I write about my work book club and how it has fostered wonderful community for my co-workers. We have been meeting for just over three years and I can honestly say it has become one of my favorite groups. I have had many people ask how the club works, so thought I would take some time to share about it today. We meet every other month, so just six times a year. We have found this rhythm works well for people, particularly those that aren’t reading a ton beyond book club. Everyone is invited to bring books to the table for consideration, but since I read the most, it tends to mostly be my recommendations – ha! We email out suggestions ahead of the gathering (usually the week of our gathering) so people can peruse reviews on Amazon, etc. We try to make sure that books have a 4.5 star rating or higher. We tend to mostly read newer books, though have done an older book a few times. You can see choices of books from a past gathering spread on the table in the above photo. Below is a list of the books we have read. I have starred the books that have been our absolute favorites, based on the conversations we had around the books. Ready Player One: We saw the movie as a group after discussing the book. We always know the next TWO books we are going to read. So, in October, we selected our February book. Make sense? Some book clubs opt to pick the whole year, but we like selecting just two at a time because we can pivot based on how discussions have been, how people have been feeling, the season we are in, etc. Other book clubs let the host pick, but not all hosts are voracious readers, so we let the group pick. Whoever is in attendance gets to decide the next selection. We rotate hosting. There are enough of us, and we meet infrequently enough, that typically someone only hosts once or twice! The person who hosts provides dinner and wine. We have done everything from pizza to enchiladas to take out. Anything goes, as long as the host keeps it simple. We are an easy bunch to please. I would encourage anyone to start a book club – with work friends, neighbors, church friends, whatever. Keep it simple, choose good books and offer yummy food and you’ll be set. I’ve had so many women in my book club say that the book club has changed how they read. They find that they are reading better, more interesting books, all thanks to the club. More importantly, I believe our relationships with one another have deepened thanks to gathering outside the office. It’s truly been a game changer.